Thursday mornings during the school year the high school and middle school students can be seen being tossed a bagel as they walk by the rectory. 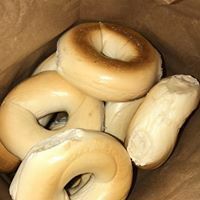 Through the generosity of John Laracy at The Bagel Inn in Holden we receive 5 dozen fresh bagels each Thursday morning during the school year to provide a quick bite for the students. One of John&apos;s employees donates his time to quickly drive them on over. If you happen to be driving by Holden stop in and tell him hi for us.